In the Winter of 2007, I was driving in KTown and saw a group of 50+ ridazz hanging out on the side of the street. I didn't know what it was, but remember being fascinated by it. Riding bikes at night with a group seemed like a fun thing to do. Later, I would stumble upon the websites, bikeboom.net and Midnightridazz.com. My first group ride was in Spring of 2008, on the KTown FNG, where I was promptly dropped but still had a good time. Around that time, I also checked out Sinz and Sprockets, Chill Chinatown Mosey, and LACM. When I moved to the Westside a year later, I would venture out to Taco Tuesdays, Cub Camp, and Root Run. In addition to GFunk, a weekly group ride based in LBC that I help organize, I try to make it out to The Passage (one of the best rides in LA), or TRFKAS (aka Silverlake aka KTown FNG v3.0). I wouldn't necessarily say that any ride should make a comeback, but I do miss the Sinz and Sprockets monthly rides. We've all had to start somewhere, so it's okay to make mistakes as long as you can learn from them. Just be respectful of the streets and try to learn from the ride leaders or other veterans. In the end, we must all realize that, although we are individuals, we are all a part of a larger community so our individual actions (good and bad) represent the entire community. Don't be an a-hole on group rides, because then people will think we are all a-holes. Be respectful and act with class, and people in the community will all see us that way. I've had the privilege to meet (and observe from afar) many great ride leaders, and I try to learn from them. We all ride for different reasons, and we all enjoy different types of rides. When I lead a ride, I try to remember all the great things that I've enjoyed and learned from previous rides and I try to incorporated those ideas. Smaller rides are easier to manage, and the experience is more personal. Larger rides have an incredible vibe, but are more difficult to keep organized. I enjoy both, but these days I tend to stay away from the larger rides because 1) I live farther away now and 2) stuff could go down on those larger rides that I may not be able to anticipate. Best: being in the streets of LA at night with a group of cool, like-minded individuals. Worst: getting harassed by motorists, or getting dropped in an unfamiliar part of town. 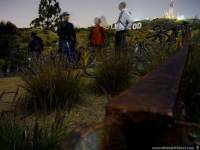 I've always enjoyed riding bicycles; group riding at night was something new that I picked up here in LA. Prior to Midnightridazz, I did not have that feeling of liberation or excitement. Group bike rides make cyclists more visible. As such, advocacy for cyclists' rights has increased. On the other hand, group rides have made cyclists easier to classify and target. What people must realize is that one's actions now reflect back onto the entire community. One irresponsible cyclist makes us all look bad. There are a handful of ridazz who I've learned from and who I truly admire. But Midnight Ridazz is a community that is defined by each and every one of us. To say that one person embodies the spirit of MR, in my opinion, discounts the rich diversity within the community. Some want to run us off the road, and some want to join us. How we interact with the "public" will influence those perceptions. Although I haven't been around since the beginning, I can already see how MR has evolved over the last 2 years. It really has been an interesting social experiment in progress- will be interesting to see how things play out in the future. I will say that the diverse group of people I've had the pleasure of riding with has helped inspire in me a new perspective on life. MR is a unique experience, and that experience is different from one person to another.